Crude steel is the term used for the first solid steel product which is produced during the solidification of liquid steel in a steel melting shop. Crude steel is part of saleable steel when it is supplied to customers for its use or for further processing. Crude steel is normally processed into finished steel either by rolling or by forging processes. World steel association also includes liquid steel which goes into production of steel castings under crude steel for statistical purpose. 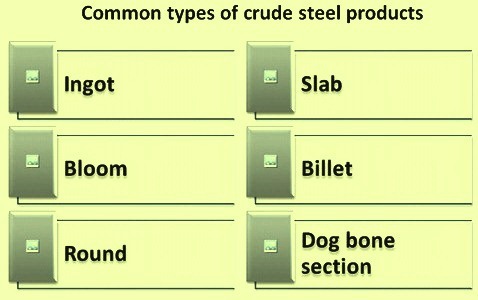 Various common types of crude steel products (Fig 1) include (i) ingot, (ii) slab, (iii) bloom, (iv) billet, (v) round, and (vi) dog bone section. Crude steel products are also semi-finished products since they need further processing for the production of finished steel. Ingot is the product obtained by pouring liquid steel into cast iron mould of a shape appropriate for the subsequent processing generally by hot rolling or forging into semi-finished or finished products. The shape generally resembles a truncated pyramid or truncated cone. The side surfaces can be corrugated and the corners are more or less rounded. Depending on its subsequent conversion requirements, ingot can be dressed and/or hot scarfed or cropped. The usual cross section of ingot is square, rectangular, round, oval, or polygon. Ingots with square cross section are used for rolling into billets, rails and other structural sections, whereas, ingots with rectangular cross section, are generally used for rolling into flat products. These ingots usually have a width which is two times or higher than the thickness. Round ingots are used for the production of seamless pipes. Polygonal ingots are used to produce tyres, and wheels etc. Low capacity steel melting shops with induction furnaces produce very small cross section ingots which are called as pencil ingots. Typically ingots used for the production of rolled products have weights in the range of 5 tons to 35 tons. Pencil ingots are used for the rolling of merchant long products and reinforcement bars and have weights typically in the range of 100 kg to 200 kg. Ingots used for the production by forging of the heavy equipment/components can be extremely large ingots weighing even 600 tons and more. Ingot is a conventional crude steel product, but presently it constitutes a very small percentage of global crude steel production. However, ingots are still fundamental for specific low-alloy steel grades and for special forging applications, where products of large dimension, high quality or small lot size are needed. These large dimension ingots are being used these days in the power engineering industry (e.g. shafts for power generation plants, turbine blades), the oil and gas industry (conveying equipment, seamless tubes), the aerospace industry (shafts, turbines, engine parts), ship building (shafts for engines and drives), tool making and mechanical engineering (heavy forgings, cold, hot and high-speed steels, bearing, drive gears) as well as automotive engineering (shafts, axes). As the demand of heavy ingot increases nowadays, especially from the power engineering industry and ship industry, there is a tendency of producing extremely large ingots, which are mainly applied for pressure retaining components such as reaction vessels for nuclear power plant and rotating components like drive shafts of gas turbines and generator rotors. The general macrostructure that is often seen in the steel ingot can be divided into three distinct zones namely (i) the outer chill zone with small crystals of approximately equal size, (ii) the intermediate columnar zone with elongated columnar dendrites, and (iii) the central equiaxed zone with relatively large equiaxed grains. Besides the referred three zones, a region where the outer columnar dendritic structure transfers to the inner equiaxed grain structure is commonly observed. This region is named as the ‘columnar to equiaxed transition’ zone. Slab is a crude steel product produced by continuous casting of liquid steel in a slab casting machine. Slab has a rectangular wide cross section with thickness normally in the range of 150 mm to 350 mm. The width of the slab is greater than 500 mm and the usual width to thickness ratio is at least 3 to 4. The length of the continuous cast slabs can be cut as per requirement. Slabs are the starting material for the production of hot rolled flat products such as plates, hot rolled coils, strips, and sheets etc. Slabs are also used for the fabrication/forging of the components of heavy machinery. Slabs are produced in carbon steels, low alloy steels and stainless steels. Depending on their subsequent conversion requirements, slabs can be dressed and/or hot scarfed or cropped. Slabs are to be free from all harmful defects such as longitudinal and transverse cracks, jointing, scum, scab, shrinkage cavities and any other indications of surface and internal unsoundness that may adversely affect the final product. Specifications for slabs can vary, but each must feature the chemical composition necessary for producing the desired product. The camber and bend in the slab is to meet the requirements of the required specification. Thin slabs are cast in thin slab casting machines and these slabs have generally a thickness in the range of 50 mm to 80 mm. Thin slab, after its casting, travels straight to the hot strip mill via an on-line heating furnace. Thin slabs generally eliminate the need of roughing roll stands in the hot strip mill. Bloom is a crude steel product produced by continuous casting of liquid steel in a bloom casting machine. Bloom has a square or rectangular cross section. Each side of the bloom is having a dimension which is greater than 150 mm but less than 500 mm. The width to thickness ratio is always less than 2. The length of the continuous cast blooms can be cut as per requirement. Based on the demand from the power engineering industry and ship industry, there is a tendency of producing extremely heavy continuous cast blooms with thickness over 450 mm. These heavy blooms are mainly used for pressure retaining components such as reaction vessels for nuclear power plant and rotating components like drive shafts of gas turbines and generator rotors. Blooms are the starting material for the production of hot rolled structural products such as beams (both I and H beams), channels, angles, T sections, piling sections, and rails. Blooms are also the starting material for the rolling of rails, squares, rounds, and flats. Blooms are used for forging components of heavy machinery. Blooms are usually produced in carbon steels and low alloy steels. Depending on its subsequent conversion requirements, bloom can be dressed and/or hot scarfed or cropped. Blooms are to be free from all surface and internal defects so that the finish rolled or forged product quality is not adversely affected. Specifications for blooms can vary, but each is to feature the chemical composition necessary for producing the desired product. The camber and bend in the bloom is to meet the requirements of the required specification. Billet is a crude steel product produced by continuous casting of liquid steel in a billet casting machine. Billet has a square cross section. Each side of the billet is having a dimension which is less than or equal to 150 mm. The length of the continuous cast billet can be cut as per requirement. Billets are the starting material for the production of merchant bar products, special bar quality products, reinforcement bars, light sectional products, rounds, and wire rods. Billets are also used in forging industry for the production of machinery components. Billets are usually produced in carbon steels, low alloy steels, and stainless steels. Depending on its subsequent conversion requirements, billet can be dressed and/or ground or cropped. Billets are to be free from all surface and internal harmful defects so that the finish rolled or forged product quality is not adversely affected. Specifications for billets can vary, but each is to feature the chemical composition necessary for producing the desired product. The camber and bend in the billet is to meet the requirements of the required specification. Round is a crude steel product produced by continuous casting of liquid steel in a round casting machine. Round has a circular cross section. The diameter of round can vary and can be as high as 800 mm. The length of the continuous cast rounds can be cut as per requirement. Rounds are the starting material for the production of seamless pipes. Rounds are also used in forging industry for the production of machinery components. Rounds of higher diameter are mainly used for forging of the pressure retaining components such as reaction vessels for nuclear power plant and rotating components like drive shafts of gas turbines and generator rotors. Rounds are usually produced in carbon steels, low alloy steels, and stainless steels. Depending on its subsequent conversion requirements, rounds can be dressed and/or ground or cropped. Rounds are to be free from all surface and internal harmful defects so that the finish rolled or forged product quality is not adversely affected. Specifications for rounds can vary, but each is to feature the chemical composition necessary for producing the desired product. Dog bone section is a crude steel product produced by continuous casting of liquid steel in a continuous casting machine designed for casting of this section. The section is named as dog bone since the cross-section has a look which is similar to a dog bone. The length of the continuous cast section can be cut as per requirement. Dog bone section is the starting material for the production of hot rolled heavy beams (both I and H beams). The section is generally produced in carbon steels and low alloy steels. Depending on its subsequent conversion requirements, dog bone section can be dressed and/or hot scarfed or cropped.